Morgan Stanley: "Something Is Afoot In Global Macro Markets"
Having recently called the peak in 10Y yields, over the weekend Morgan Stanley's chief rates strategist Matthew Hornbach looked at what else is going on and concluded that "something is afoot in global macro markets." Bitcoin just made a new year-to-date low below $5,922 on Thursday, June 28. The price of gold in US dollars also fell to local lows and is mounting a challenge of its December 2017 nadir (see Exhibit 3). Is it just the bloom coming off these roses? Or do investors need US dollars - cash - to settle claims against them? Borrowing cash to settle claims has become increasingly expensive, thanks to the Fed's efforts to remove monetary accommodation and tighten financial conditions. What is notable is that it was about a year ago that Morgan Stanley's nemesis, Goldman Sachs, was perplexed how the more the Fed raised rates, the easier market conditions became, going so far as to say that after the March 2017 rate hike, which sent stocks higher, "this is not the reaction the Fed wanted." Fast forward to today when, as Hornbach counters, "Guess what? It's finally working." No longer can borrowers, increasingly non-financial corporations since the financial crisis, take out a loan at 2017 prices. Investment grade corporate spreads are not only at year-to-date wides - having widened by 40bp since February 2 - but they are also wider than their widest levels of 2017, according to the Bloomberg Barclays US aggregate corporate option-adjusted spread. In yield terms, the US aggregate corporate yield-to-worst is at 4.0% - the highest yield level since 2011 (see Exhibit 4). At the same time, the yield on US dollar cash has increased dramatically. 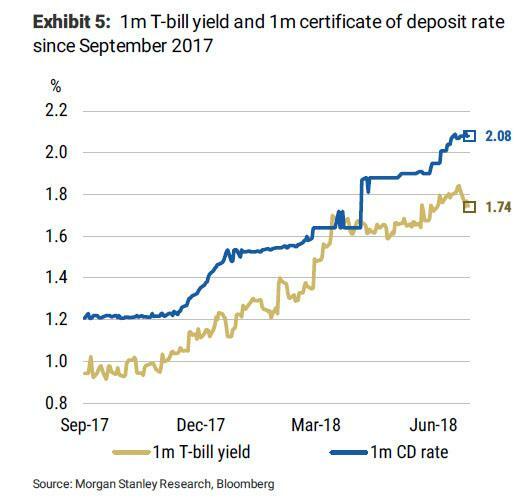 The 1m yield on a T-bill is up 80bp and the rate on a 1m CD is up 87bp since Labor Day 2017 (see Exhibit 5). 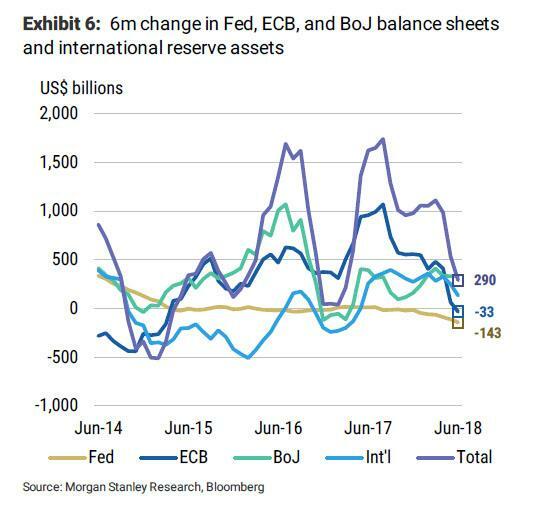 The rate at which global liquidity has increased - loosely defined as the change in major central bank balance sheet sizes and the change in international currency reserves - has fallen rather dramatically over recent months led by the ECB's balance sheet (see Exhibit 6). We expect this decline to continue in the second half of the year and lead to even tighter financial conditions both in the US and abroad. 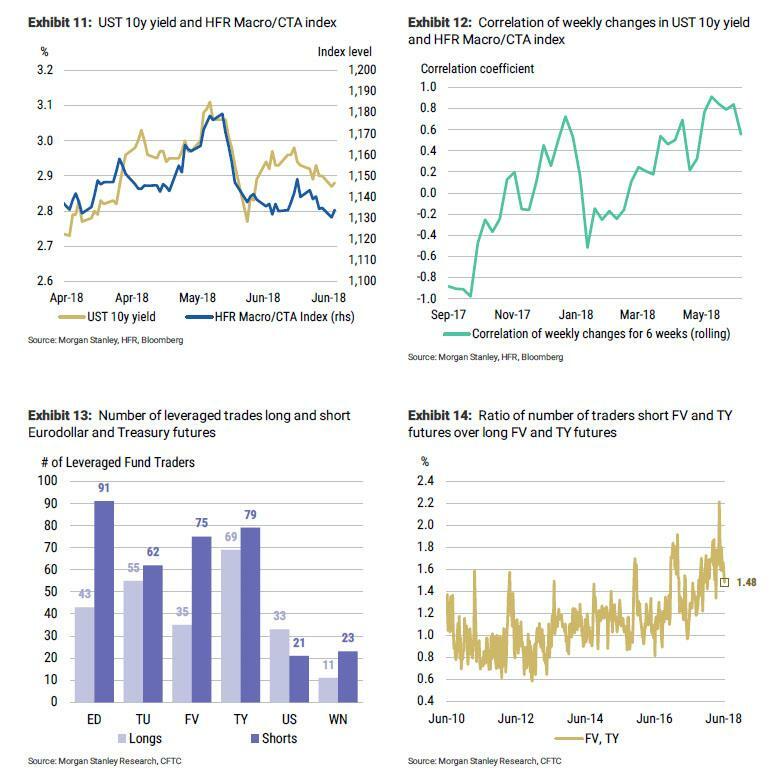 This decline in global liquidity and tightening in financial conditions should benefit longer maturity Treasuries. Note, however, that not even MS is ready to turn bearish on stocks, and instead the bank's reco is the inverse: "We continue to suggest long duration positions via the 10y Treasury note." Selling government bonds was the trade of 1H18. Many expect it to be the trade of 2H18 as well. We take the other side. Short positions have come down in the recent rally, no doubt. But hedge funds still trade US rates from the short side. Over the past 6 weeks, the correlation coefficient between weekly changes in 10y Treasury yields and the HFR macro/CTA index has been +0.55 and was recently as high as +0.92 just 4 weeks ago. When Treasury yields go up, macro funds have done well. Measures of sentiment also point to persistent bearishness in the rates market. The instruments of choice for most leveraged Treasury bears have been FV and TY futures, and Eurodollar futures have been popular as well (see Exhibit 13). We measure sentiment in the futures market by looking at how many traders are long vs. how many traders are short, instead of looking at actual positions which net to zero. Amongst leveraged funds, sentiment in FV and TY futures is still very bearish, though not at recent extremes (see Exhibit 14). very strong data in 2Q18 that has many tracking estimates of real growth around 4% (see Exhibit 15). From our perspective, the increase in Treasury supply related to Fed balance sheet normalization and fiscal stimulus is already in the price of longer maturity Treasuries. In addition, real economic growth around 3% in 2018 is also already in the price. As for the Fed, we see a central bank intent on tightening financial conditions with less accommodative monetary policy and we think they will have increasing success as this year wears on. Finally, while 2Q18 growth looks to have been strong, forward-looking indicators of growth in the equity market have started to roll over. In particular, Morgan Stanley points out a basket of corporate stocks that are fundamentally levered to business investment has started to underperform the broader S&P 500 index (see Exhibit 16). The relative performance of this basket has tended to have a coincident relationship with the ISM manufacturing index. If the ISM manufacturing index declines from recently elevated levels, investors will have to adjust lower their expectations for 2H18 growth from elevated levels as well. In parting we will say that Hornbach is certainly correct: the drainage of liquidity is causing a scramble for dollar-equivalent securities and out of risk assets (and if it hasn't yet, it will soon). However, the bigger question is what happens if the shortage becomes so acute asset managers fund themselves to sell both stocks and bonds to obtain immediate funding. In that case, first proposed by Jeff Gundlach at the start of the year as a worst case outcome heading into the next recession in which an equity plunge does not lead to a Treasury bid, there would be two options: either the Fed steps back in the market and injects a few trillion moral hazard equivalents... or all bets are off.